Sky-Aura-Ten Square Meaters was founded in 2009. After 12 long months of reading and researching many breeds of cattle, we had decided that Square Meaters were the type of cattle that we new we could not go past. The next step was, should we start with Heifers or go for a 3 in 1 package. Our first stop ... Vesco's Square Meaters at Prenzlau... Jo Van Elten was great, giving us a tour of her property and animals. She was a very helpful and spent a great deal of time talking about her beautiful cattle, but unfortunaley had very little stock for sale at that time. 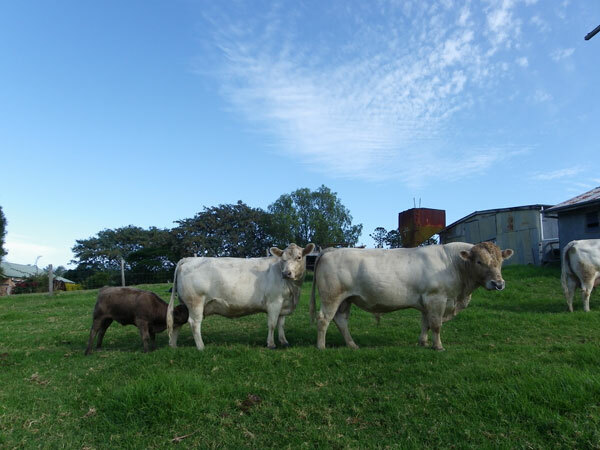 After visiting a few more studs and checking out the EKKA we arrived at Warrill Creek Square Meaters at Purga...Dawn and Bevin Voight were also fantastic with a 'True Love' for everything Square... and they had some nice heifers for sale. Our foundation girls were Warrill Creek 'Dolly' and Warrill Creek 'Dainty. We could not have been happier... not only did we purchase 2 fantastic heifers we have made some great friends. Their service to the society has been impecable, through their vast knowledge they have guided us with everything Square Meaters from the start... and we would like to truly Thank them for their help. Now we hope to continue that service to others through any ongoing sales and support we may offer. Please have a look around site...check out our pictures, and consider Square Meaters...you will never look back.